Despite my recent announcement that Triathlon and I are on a break, we had one last rendezvous this weekend. 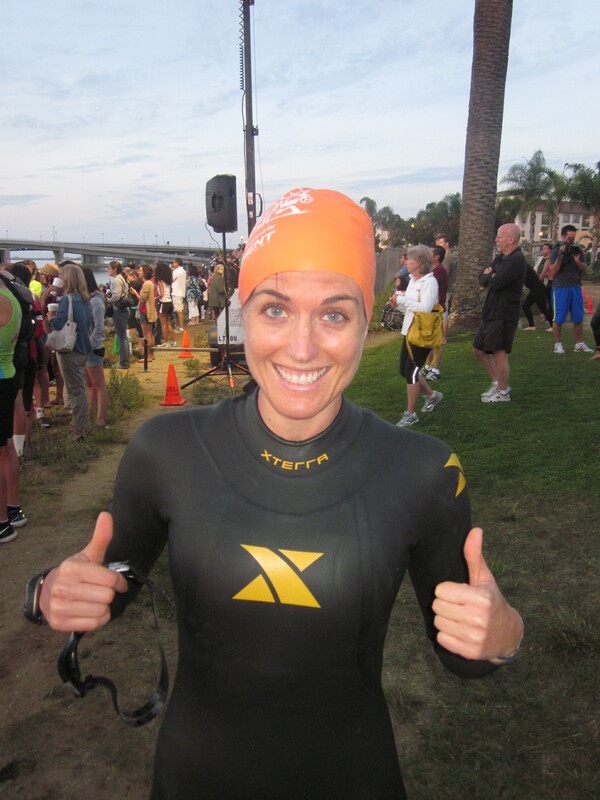 I busted out my wetsuit, stiff from non-use since Ironman Coeur D’Alene, pumped up Rory’s tires and packed my tri-bag full of all the necessities to swim 750 meters, bike 12 miles (which turned out to actually be close to 14), and run a 5k in succession. Mike and I drove down to Point Loma on Friday night for the Expo which was held at the hosting cycle shop, Moment Cycle Sport in Liberty Station. We had never been to Liberty Station and the best way for me to describe it is some form of Pleasantville. It’s a mini-community with grass-lined roads dotted with stores, mostly featuring well manicured lawns pressed up against a small strip of San Diego bay. The expo was small and well-organized. 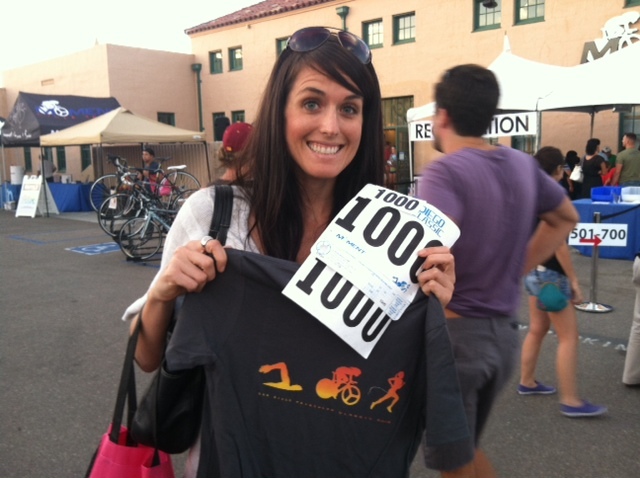 I picked up my awesome race number, 1000! 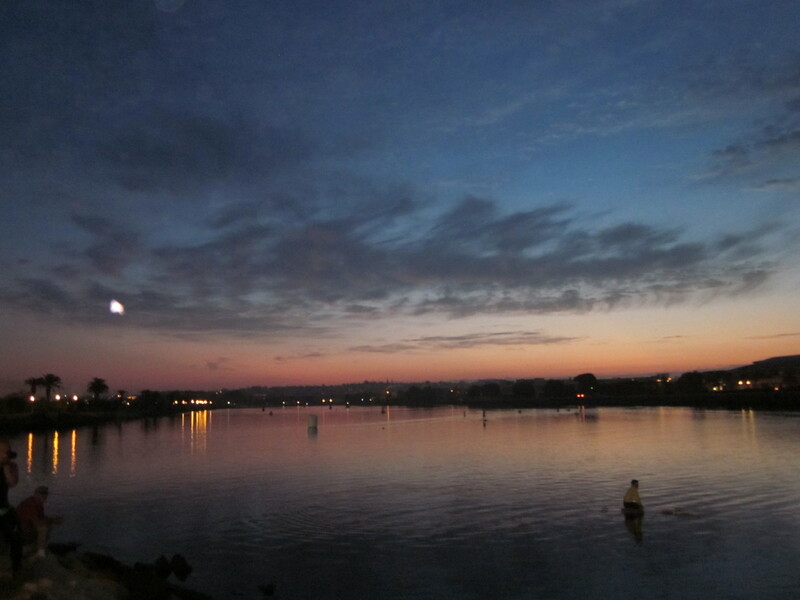 Race morning was typical – we got to transition with about 20 minutes to spare (my wave was last) and I rushed to get my stuff set down, get my body marked and use the restroom. 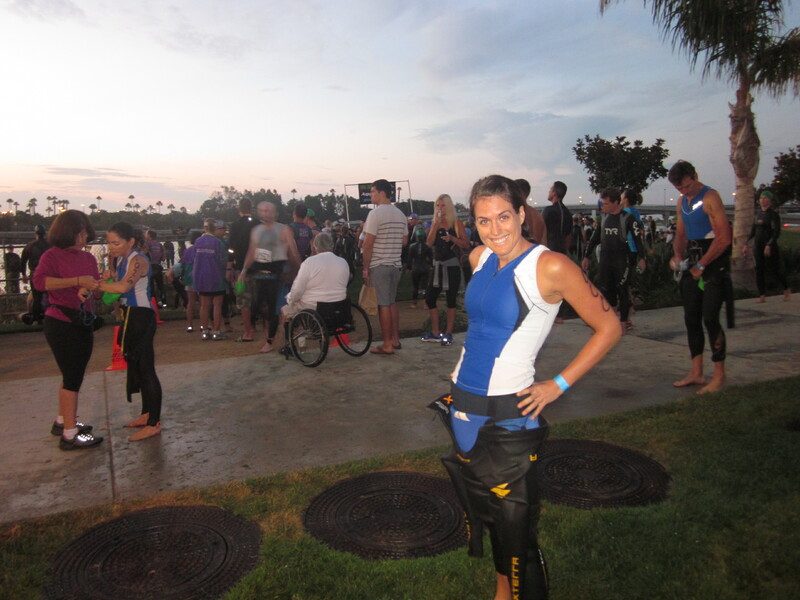 It was a hurry up and wait situation where as soon as I left transition, I had about a 40 minutes until my wave start. It was an absolutely beautiful morning and we enjoyed the gorgeous view from the start! My expectations for this race varied. I wanted to have fun but also hoped for a spot on the podium. My lack of recent training (total of 3,300 yards swam and 3 outdoor bike rides and a few spin classes in the 2 1/2 months since CdA) didn’t give me a lot of confidence, but I also knew that I had a solid foundation of fitness leftover from 1 year of Ironman training. I also knew that since this was the first year that the race hosted a sprint, that there would be less participants, thereby increasing my odds of being one of the top three finishers in my age group! All participants in the sprint started in the same wave, about 12 minutes after the last Olympic wave. I didn’t realize this and got in the water and swam to the buoy line right after the last Olympic wave left. Then the announcement came that we had a wait. Luckily the water was nice and warm (70 degrees) and I just floated around, chatting with other participants and warming up. 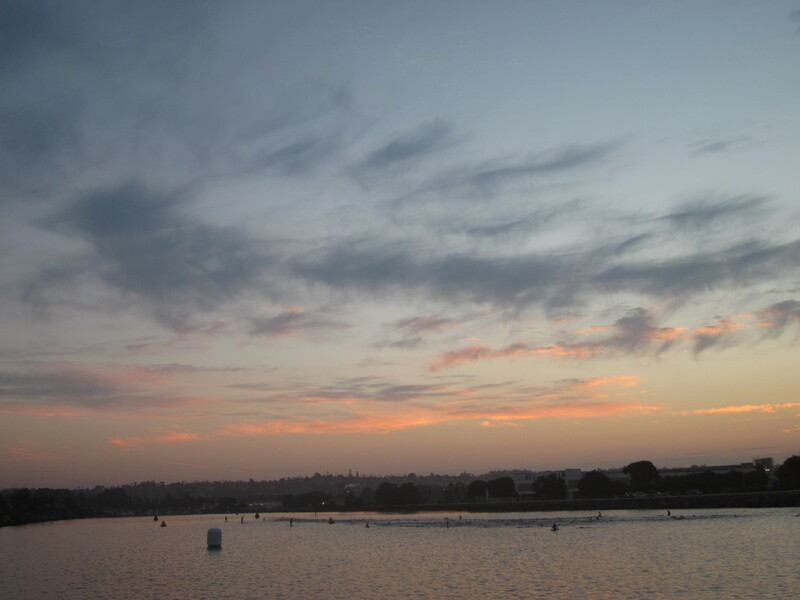 The swim course was 750 meters – a fairly long swim for a sprint triathlon (Solana beach tri is only 400 meters!). The sprinters would turn about halfway down the Olympic swim course and make their way back. I wasn’t really sure how to seed myself at the start, so I just went slightly to the right of dead center between the start buoys and started a couple of rows of people back. When the canon fired, I started swimming a little too hard, and soon I was out of breath. Pacing yourself in a sprint triathlon is interesting because you don’t want to leave anything out on the course by taking it too easy but you can easily overdo it. I definitely overdid it and by about halfway to the first turn buoy I was wishing the swim was over. My back and shoulders were burning and my breath was heavy so I slowed down a bit. I had been able to draft off someone for a bit but lost them and was on my own for the rest. The turn at the first buoy was a bit rough and I had quite a bit of contact with other swimmers, but nothing compared to the mass swim at IM CdA. Once I rounded the second buoy, now I was joining the Olympic distance swimmers who had started earlier and were making their way back. It was congested and I had to weave around several swimmers. 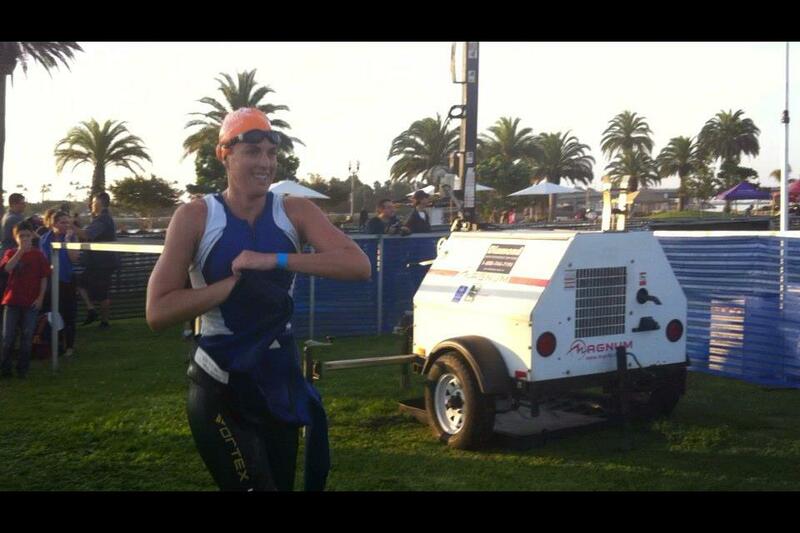 Once I hit the final buoy and made my way to the stairs and climbed out, I was relieved that the swim was over! After I ran up the stairs, I hit the timing mat and ran down a long aisle of spectators cheering the racers on. Mike was at the end of the aisle and was taking pictures and/or filming me (can’t remember which but he did this throughout the race). It was so nice to have someone there to cheer me on! I had to run all the way to the end of transition, enter transition and then run all the way back down the aisle to my bike. Besides the running, I don’t think I wasted much time in transition. 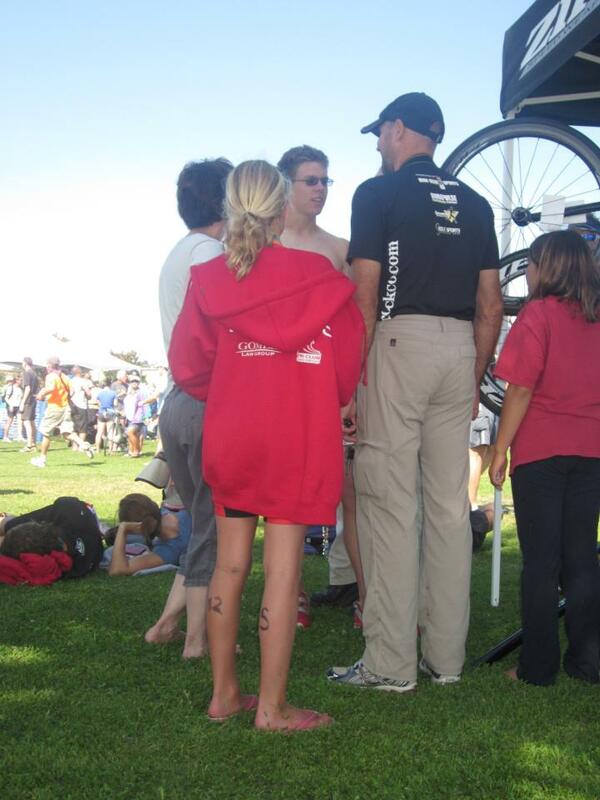 This was the first time I sat down in transition to take my wetsuit off and put on my shoes. Once on the bike, I felt great. 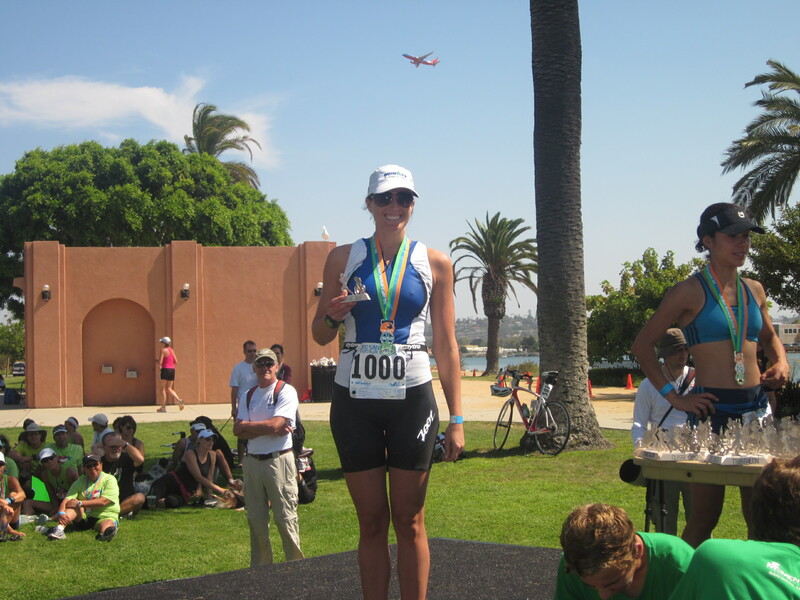 Since I was finishing with Olympic distance athletes too, the course was quite crowded. Since I had no idea how the course went, I took my time around corners, slowing down to make sure I had enough room to maneuver. Cornering is definitely a skill I still need work on. Once I caught my breath, I got into a rhythm and started to really enjoy the ride. I was passing quite a few people, definitely more than were passing me. I noticed a girl in my age group right away and we started to play leap frog. 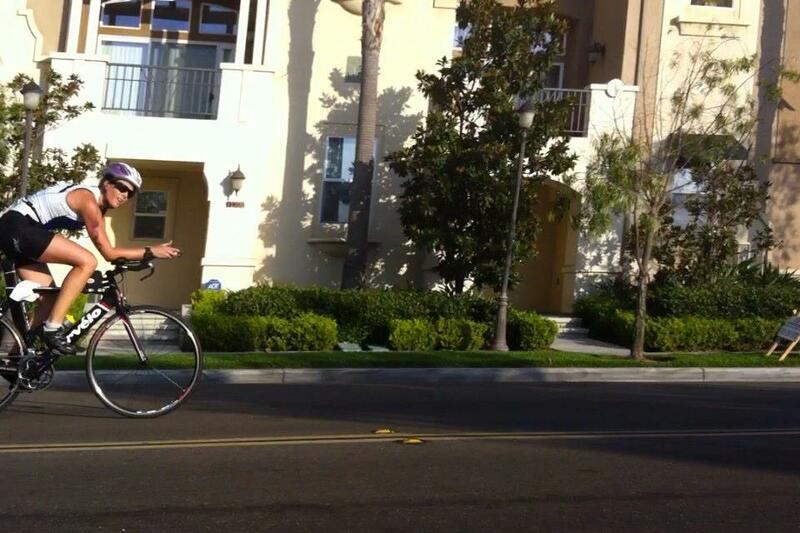 At this point the course had started weaving up some large hills through Point Loma. I wouldn’t say that hills are my strength, but considering how many I climbed in preparation for Ironman CdA, they also aren’t my weakness. Toward the middle of one of the hills, the girl in my age group came up besides me on my left and said to me, “I keep trying to catch you and I can’t!” I kind of laughed in agreement and pedaled a little harder. I never saw her again! There was a very long, steep hill at one point that had people climbing out of the saddle and huffing and puffing. Once we got to the top of that, there were more rollers that led to the top of Cabrillo National Monument. The monument is closed to the public but is also the start of the AFC half marathon so I have been there the last three years. It was fun to ride my bike through the empty parking lot that just three weeks ago was filled with anxious runners and hundreds of porto-potties! The view from the top of the hill was absolutely beautiful, just as it was before AFC a few weeks ago. After the sharp U-turn at the monument, we headed back through lots of rolling hills. At this point most of the men that I had outswam in the sprint has passed me and I was riding among mostly Olympic cyclists who were probably pacing themselves to race much longer than I was. Basically I spent the entire ride back passing people! I rode the downhill portions hard only if I knew there wasn’t a sharp turn coming (I had been warned about a particular set of two sharp turns that cause crashes every year and ambulances are set up there waiting for it!). Once we got back near the harbor, the Olympic riders kept right and the sprinters went left. Once the split happened, the roads were seemingly empty! I passed two women right around here, thinking I was headed into transition since my watch said I was close to 12 miles. However, the course kept going and looped through Liberty Station. Once my watch hit 13 miles I started getting worried. I started to think I took a wrong turn! I asked a volunteer on the side of the road if I was going the right way and he said yes. So I got back in aero and kept going. Once I pulled into transition, my watch said I had rode nearly 14 miles. As soon as I got off my bike and started running through the grassy transition with my cycling shoes on, my heart rate went way up. My transition area was set up the farthest you could get from the dismount line so I had a way to go. I started to realize how hard the 5k was going to be! The sun was out and it was really hot and humid. I remember being glad that I only had to run 3.1 miles instead of the 6.2 that the Olympic racers would have to do! Mike was there cheering me on and filming me again which boosted my spirits. Since the bike racks weren’t set up by age, I had no idea what place I was in when I got my shoes on and headed out of transition. I did know, however, that I was doing well. The run course looped along the park in Liberty Station and as soon as I started running I could tell there weren’t that many athletes off their bikes yet. As soon was I was running, my breathing was labored and my heart rate was high. I was running in the mid to high 7 min/miles which is definitely not a pace that I have practiced as of late. The first half mile was a mental battle. I kept repeating in my mind my favorite mantra “pain is temporary, pride is forever” and reminding myself that if I could do an Ironman, then I could stick out this pace for the next 23 or so minutes. I even thought of Chrissie Wellington and tried to put a smile on my face despite the pain! The worst part of the course was a little jaunt over a bridge which required us to run up a hill, down a hill and then make a u-turn and do it all over again. As I was coming back over the bridge I saw the woman who was closest behind me. I put on a smile to make it seem like I wasn’t in pain! As I turned off the bridge and was back on the path, I saw Mike who was cheering for me. He yelled “you are the 4th woman overall!” I yelled back “4th woman! ?” I was in shock! Later I found out that I was actually the 6th woman overall – apparently Mike missed 2 of the women (he claims they looked like guys and that is why he missed them). I don’t really care if I was 4th or 6th, just hearing that i was so far up in the field made me want to work even harder to keep my position. I also knew that most likely I would make it to the podium since I knew that one of the women ahead of me was older and one was younger (i.e. 12 years old!). Mile 2 was a bit slower. It was hot and I slowed to drink water at the aid station. I poured water on my head and kept going. I saw the woman that was behind me again and was happy to see I increased my lead. I hit the other side of the aid station not too much longer and slowed a bit again to get in water. I was so thirsty and hot! The next portion was an out and back so it was easy to see your competition. As I made my way down I saw the women that were ahead of me and realized I probably wouldn’t be catching them. On my way back on the loop, I first got passed by the lead pro male in the Olympic race and then I saw a woman running really fast on the other side. I could tell she was older and wondered if she was a pro because she was running so fast! I knew she’d catch me. I picked up the pace a bit just in case it helped. Once I was in the home stretch toward the finish line, the older, speedy woman passed me. Her calf said she was a 48 year old age grouper. She was killing it! I saw Mike shortly after this. I was breathing so hard that I was wheezing. He told me to catch the two women ahead of me – one was the 48 year old speed demon and the other was a woman I had been slowing making progress on the entire time. I decided to try to at least pass the 2nd woman. 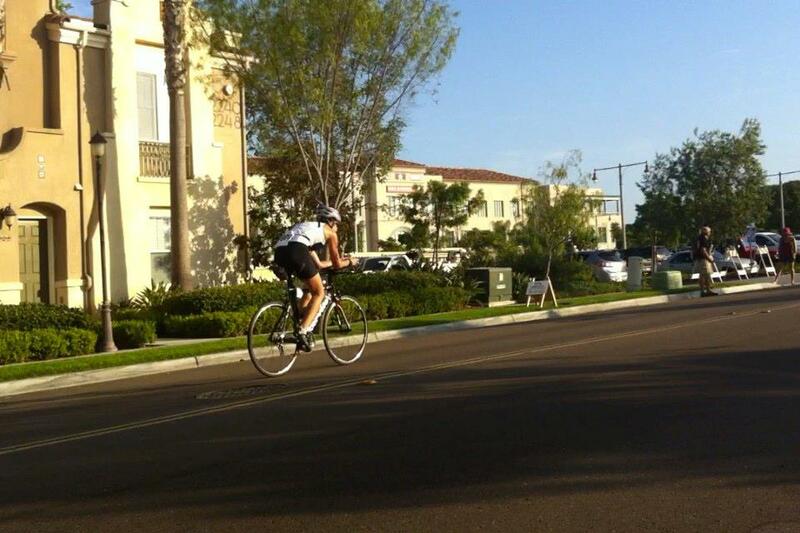 I picked it up, pushing myself to my limits, and with about 100 yards to go, passed the woman! Crossing the finish line felt great and as soon as I got my medal, I took a seat on one of the chairs and tried to catch my breath. I left it all out there on the run, that’s for sure! While we waited for results we cheered on fellow Tri Club and Active racers. 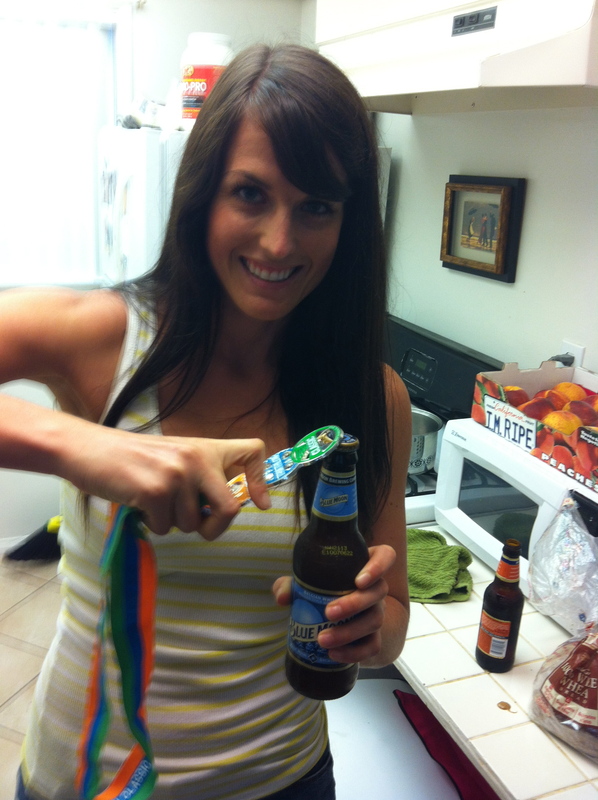 Once the results were posted, I found out that I was 2nd in my age group and the 6th woman overall! I was really happy with my race. 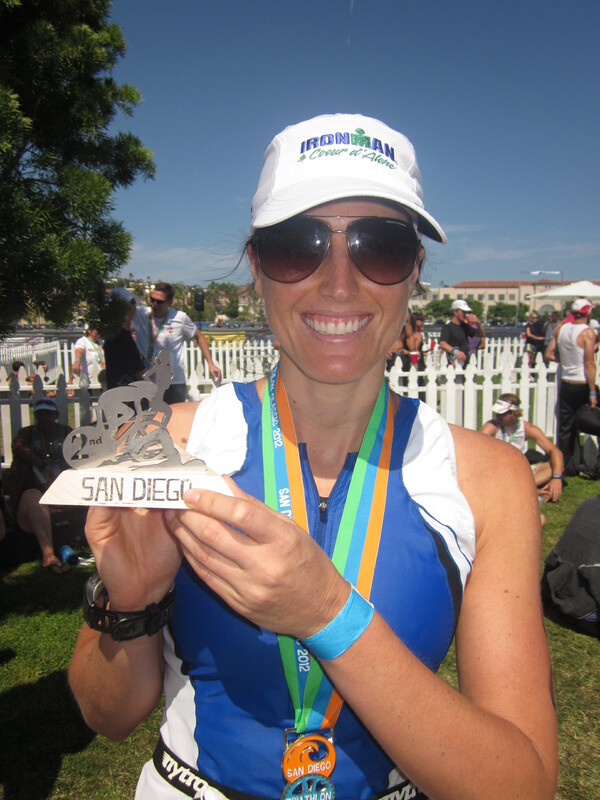 It was the perfect finale to a long year of triathlon training. Congratulations, Nicole! It sounds like a really solid race for all three disciplines. Way to run (and smile) through the pain and finish strong! 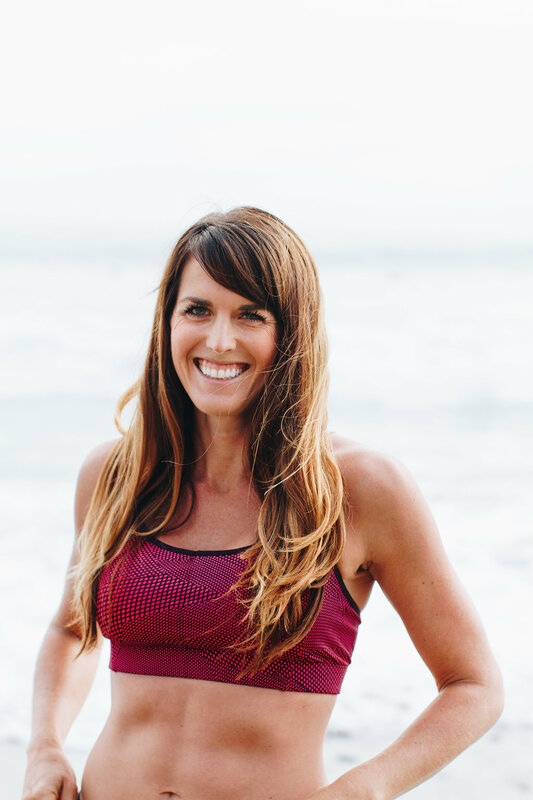 Now you can focus on running and get back to tri later on! Congrats on a great finish to the season! I especially like the multi-use medal. You dominated – as we all knew you would 😉 Congrats!